Last time around, there was at least a short, if not very informative, description of each boat. This has been dropped, the ship listing little more than a spotters’ guide listing a few salient facts such as the year of build, construction number (why? ), passenger beds, and whether there is a balcony. Even here the narrative is incorrect in many places with one item called “sit outside (real) balcony”. Scenic and Emerald have the most innovative of balconies, but the book says “no”. Noted of real value is the listing of a lift (elevator), these ships not suitable for persons with movement restrictions unless thus fitted. The name of the operator is given for each individual ship but does Luftner Cruises mean anything to anyone? In fact it is the highly-rated Amadeus cruise operator! In the past few years, several river-cruise companies have introduced alternative dining. It has not been easy due to the limited galley space available and with none of the European ships longer than 135m due to river restrictions. This is actually mentioned with the introductory narrative, but if you want to find out if the ship you fancy offers the choice, you cannot. It would also be nice to know if an operator is able to secure riverside moorings at most stopovers. Having to climb across up to five boats can be tiresome. All Douglas Ward has done with the book is give ratings for various aspects of the ships. It is explained within the pages, but for the casual reader who wants a reference, it is far too vague. Most cruise operators include the port tours, some include gratuities, alcoholic drinks and wi-fi, and even butler service, but, while these do get vague mentions in the body of introductory editorial, this is not shown for the individual ships. If you want to see how it done properly, take a look at Berlitz' Cruising and Cruise Ships. 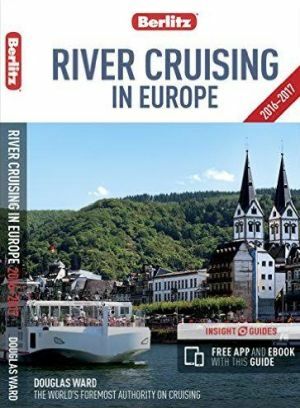 On the positive side, the book offers a fine guide to the main river-cruise ports and routes of Europe, with maps and top sights. New to this second edition, for the delight of culture vultures, are the French rivers of the Dordogne, Garonne, Gironde and Loire. While most chroniclers include Russia as part of Europe, not so this book. St Petersburg to Moscow is one of the best trips available but you will have to look elsewhere for a guide. No mention of the United Kingdom at all. Ward has made up his own mind. The book profiles 310 European vessels. If you have never been on a river cruise and want to learn more of what to expect and the pros and cons, it is in fact a fine book. But if you are an ‘old hand’, do not bother. You will know about the hidden extras (there are very few with most good operators) and will be aware that there are no doctors on board (you are never far from a proper hospital). Some ships offer a very limited gym and most usually a spa/hairdresser, but remember that the product and experience is entirely different from a deep-sea ship, more akin to a European car or coach tour where you do not have to change hotels every night. VANTAGE TRAVEL, which operates five deluxe river cruise ships in Europe, has launched its 2017 river cruise programme, featuring 11 new itineraries, multi-generational cruises with family-friendly activities, excursions and select departures where kids sail free, some of the best values for solo travellers, special-interest cruises, new Signature Journeys with shorter, more convenient itineraries, and the option to combine two or more trips on Vantage Travel’s new Grand Journeys. The new, shorter Signature Journeys optimise the best of the rivers Seine, Rhine, Main, Danube and Moselle and include a return seven-night sailing from Paris and a new seven-night Christmas market sailing in December 2017. These and longer itineraries can be booked back-to-back to create Grand Journeys, with a seamless transition between itineraries, with the opportunity to build a cruise of up to 30 nights throughout Europe.